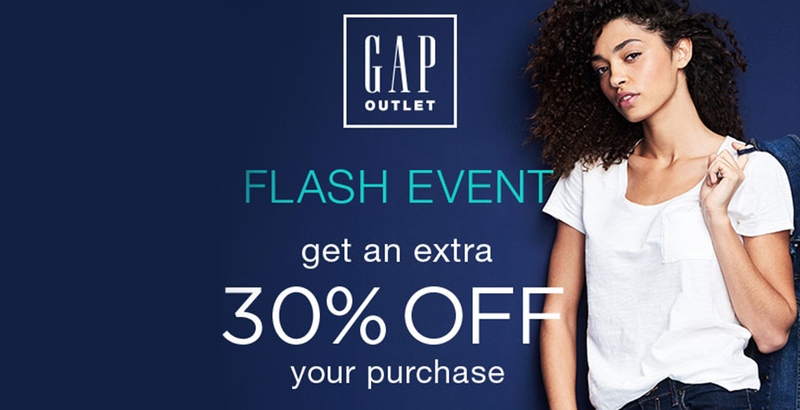 *30% off your entire purchase: Offer applies at participating Gap Outlet store in the UK and IR locations only. From 20–21 August 2016 only: subject to stock availability. Not available at Gap stores or online. To redeem offer, customer must present this voucher at the till (either print or on a mobile device). One voucher permitted per customer. Single use only and printed voucher to be surrendered at store. Discount applied at till. Gap reserves the right not to apply discount where it suspects fraudulent use. Excludes purchase of gift cards. Offer can be used in conjunction with promotion messaged ins tore. Not valid for cash or cash equivalent. No adjustments on previous purchases. For more information – ask in store for details. GPS (Great Britain) Limited t/a Gap (Company number 02275771). Berkeley Square House, London W1J 6BS © Gap 2015. Cashier use Reason code: 320.